Don’t dream your live but live your dreams! 3 years ago I quit my job as an online marketer. A great job in tourism industry, a position with career opportunities, flexible working hours and fun colleagues. For me that was not enough… I took a new turn and escaped from the rat race. I started my job as an freelance online marker, completely location independently with complete freedom to be able to work at the best spots this world has to offer! During my studies Communication I quickly realized that marketing appealed to me. The direction was quickly set: Marketing communication. Being 21 means that the world is your oyster and you should have the time of your live. That year travelling and freedom give me intense happiness. After seeing much of the world for 1,5 years it was time to start finding a job. Not an easy feat per se…. 4 years followed with various job positions, but not a commercial function most suited to me. In 2011, I finally had the opportunity and challenge to start working as online marketeer and SEO & SEA specialist with Bratpack internet services. A commercially dynamic and versatile position where I was able to learn a lot as well as a position with career opportunities and online possibilities. There weren’t that many good and experienced online marketeers around in 2011, after all. I had to study a lot outside office hours, completed several exams in order to proof that I had enough online marketing knowledge. After only a few weeks I was responsible for some clients and for top rankings in Google. It was a challenge to learn all about search engine marketing in only six months. By immersing myself day in day out in search engine marketing, I was able to become an online marketing specialist within a year. Subsequently, I switched companies twice with the same position. Working for a boss, the nine to five, not enough freedom, just 5 weeks holidays a year, a breakup as well as the knowledge and working experience made me decide to quit my job and start working as a freelance online marketeer. How I escape from the rat race? During my final months as employee and before leaving abroad I cancelled my rental property, offered all my stuff up for sale, had a website designed, set up a Facebook page and LinkedIn account, worked in the evening for some business-minded friends, asked them to asses my work, allowing me to build up a small portfolio and left the Netherlands and fly to Ecuador in the beginning of 2016. You truly have to believe in yourself and know what value you can provide. I did exactly that by getting tangible online marketing results. And as we all know, the biggest advantage of online marketing is that your results are measurable! Have a camper as my home base, which I used to see Ibiza, travel to Spain for 3 months, be in Portugal for 1 month and spend the winter in Faro. Will join the Nomad Cruise for the 3rd time already and will join 400 other entrepreneurs and digital nomads on a cruise across to Atlantic Ocean to our final destination Brazil. All my clients are from networking myself and by word-of-mouth. How do I keep up-to-date as digital nomad? I read Influencer blogs about Online Marketing. Of course, I also keep track of all Google updates, talk with other freelancers, go to networking events and visit interesting conferences, such as the upcoming floating networking conference; the Nomad Cruise. And let be honest, nowadays with the internet it’s super easy to stay up-to-date! You can’t be a specialist in everything and be knowledgeable about every system. You are enhancing your company by working together with other specialists. You can learn a lot from it and it’s good for your reach and network to. My website offers several packages and I outsource some of the activities. For example, I work together with a link building agency, copywriters, wp-specialists and programmers. If you want to grow as an entrepreneur, it is important to focus on your strengths and outsource the things you’re not good at. Because I can rely on a large network of specialists, I get these freelancers work and they do the same in return. That way you run multiple businesses together and get each other clients. And of course running a company remotely can be challenge. You continuously need to find a balance between work and private life, work and networking, working on your own company vs that of others, training and investing (outsourcing work). How did I find this digital nomad job? I created this digital nomad job myself. Specialize yourself in one subject, build experience when you don’t have it, look around in your immediate surroundings to see if you can help a friend or acquaintance out. Do exchange projects/ barters in order to create a portfolio. I started with a low hourly rate because I wanted to prove myself first. At some moment, when you notice things are going well, you can raise your rates. I did all this based on my intuition. Britt is the true digital nomad among the B. Analyzed marketing team. You’re never quite sure where she’s hanging out in the world for it could be South America. 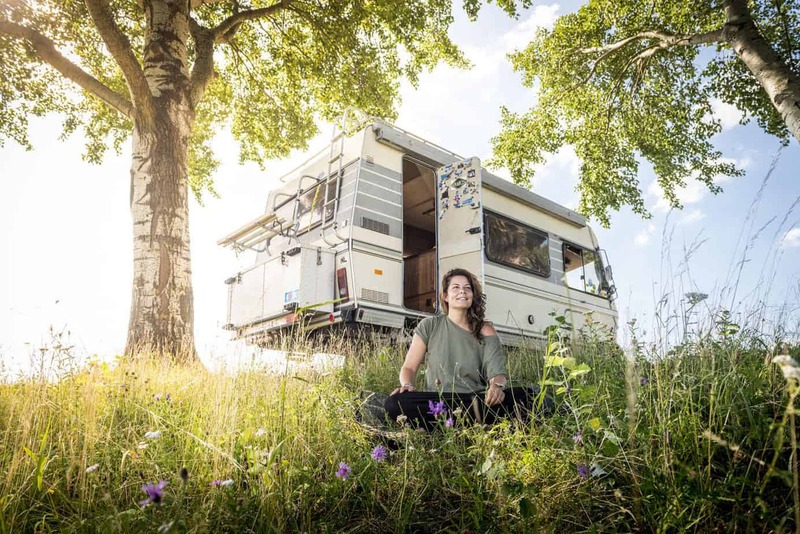 You may have even come across her in her camper van cruising Europe.. But wherever she lays her hat, she always keeps her online marketing hat on. Britt is so immersed in her passion to help you get the best Google rankings possible, that she lives, breathes and radiates online marketing. Besides her passion for travelling, digital marketing and an adventurous lifestyle, she also loves photography and visiting music festivals around the world.